This was a hard earned point gained by Annan against title contenders Queens Park in what was Queens last match to be played at the Excelsior Stadium in Airdrie before returning to the National Stadium in the New Year. Annan boss Jim Chapman had Iain Chisholm back from injury and he replaced the injured Steven Swinglehurst in defence also out was Steven Logan following his sending off in the mid week development match. The Annan boss faced more injury worry in this match as he was forced to make an early change inside 18 minutes when Steven Black had to leave the field injured. The spiders started very promisingly when Darren Millers wild shot in the 5th minute went well wide of the target and minutes later Annan had a fortunate break when Shaun Fraser’s goal was ruled offside. It was a lucky escape for the Galabankies. Watson then conceded a needless free kick in a dangerous position outside the box, Darren Miller’s subsequent effort was disappointing missing the target. 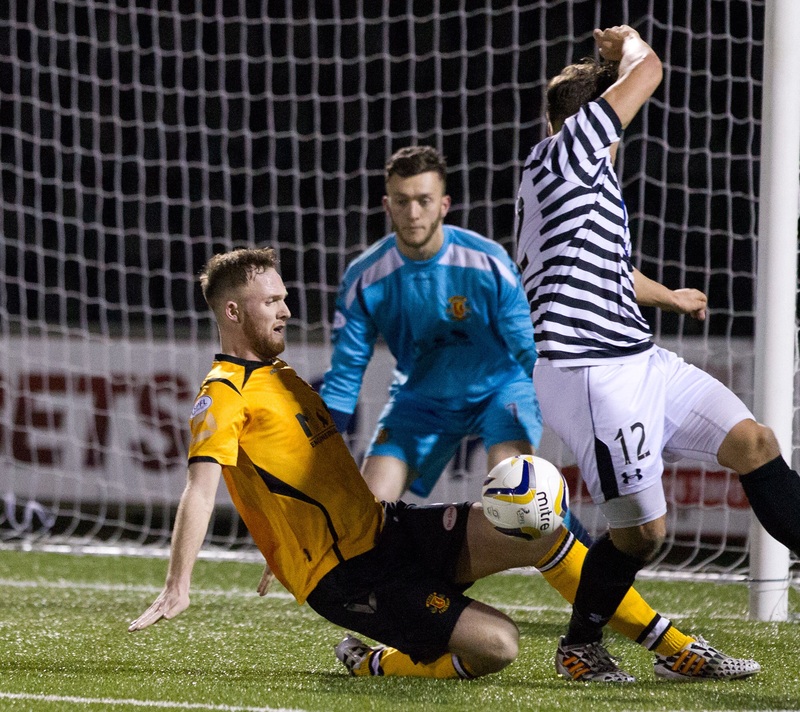 Annan forced their first corner in the 17th minute ending with Peter Watson’s header hitting the side netting. Black was replaced by Kieran Brannan who was given the job of containing the impressive Ciaran McElroy which he did to good effect. Alex Mitchell dealt confidently with Paul Woods 16 yard effort in the 20th minute. The home team were pressing for an opening and Tony Quinn’s back header went over the bar form Fraser’s free kick swung in from right. Queens Park had a fortunate escape in the 30th minute when McClolm’s pace took him beyond Quinn only to be denied by a clearance from keeper William Muir. Paul Woods effort was skied over the bar and minutes later he set up Conor McVey but with the same outcome. As the matched headed towards half time Annan created the best chance of the half when a good move created an excellent scoring opportunity when Flynn cut along the 18 yard line laying the ball into the path of Stuart McColm who’s low crisp shot went narrowly past the upright, it was a let off for the spiders but on the balance of play one the home team merited. The second half more of a contest territorially with both teams going all out to break the deadlock , Alex Mitchell confidently dealt with a 20 yard Paul Woods shot in the 52nd minute , immediately at the other end Annan broke down the left and the cross caused alarm to keeper Muir and Rooney but the ball would just not fall for Hopkirk and the chance was gone. Annan forced a couple of corners with McColms header hitting the side netting. The play switched to the other end John Carter’s shot failed to hit the target after a patient build up by the home team. The best chance of the half fell to Ciaran McElroy after Kieran Brannon slipped on the edge of the box leaving McElroy with a great chance one on one with Mitchell but the spiders front man failed to grasp the opportunity with his shot striking the base of the post. Paul Woods and substitute Gavin Mitchell both had efforts which failed to hit the target and Rooney’s header went over the bar from Millers free kick. 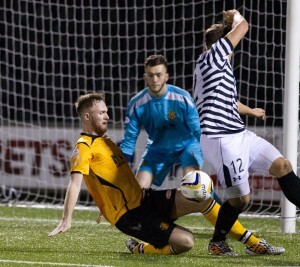 Annan brought on Scott Davidson for Stuart McClolm and as the game entered the last tem minutes chances came and went at both ends with Fraser’s effort failing to hit the target and Ronney’s header going past the post. Scott Davidson’s effort beat the keeper but went narrowly past and David Hopkirk then tested Muir who pulled off a good save to deny the Annan player. Annan had to withstand a late Queens park flurry but the Annan defence were solid throughout the game and confidently dealt with anything the Queens attack through at them and in the end both teams had to be satisfied with a share of the points. ANNAN ATHLETIC: ANNAN ATHLETIC: Alex Mitchell, Steven Black (Keiran Brannan 18 min), Iain Chisholm, Martin McNiff, Peter Watson, Ryan McStay, Josh Todd ,Matthew Flynn, Peter Weatherson, David Hopkirk, Stuart McColm ( Scott Davidson 80 min) Subs not used Jake Gemmel GK, Rabin Omar.